Heather holds a local winter weather forecaster in the palm of her hand! You’ve heard of Puxatawny Phil, the groundhog that supposedly forecasts the coming of spring. 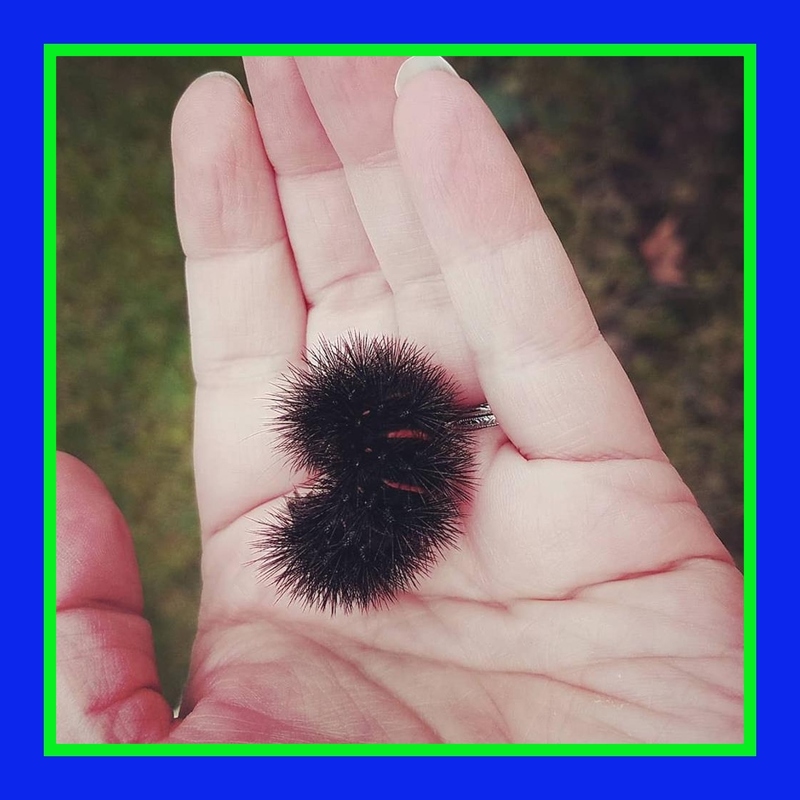 But have you heard of the woolly worm, or woolly bear, as it is sometimes called? Last week two colleagues of mine discovered some woolly worms hanging around outside our office. Just so you know, woolly worms aren’t actually worms at all. They are really caterpillars that turn into beautiful moths. Here in the south, the name worm stuck for some reason. Maybe it’s the alliteration? Folks in the midwest and northeast call these little guys woolly bears. I don’t see a logical connection there either, but maybe it’s just me! Anyway, these fuzzy fellows are deemed to be forecasters of upcoming winter weather. Each worm has 13 segments that are either black or rusty brown in color. According to folklore, the more black bands, the more severe the winter weather. There is even mention of timing. For example, if the head end of the caterpillar is black, the beginning of winter will be harsh. If the tail end is black, the end of the winter will be harsh. (I’m told moth caterpillars have four to six pairs of eyes.) Even if I can’t tell one end of this north Carolina fuzzball from the other, it’s clear our winter could be severe. What about in your neck of the woods? Do you have critters predicting your winter weather? I love this stuff (and so will your students)! Not critters, but fogs. The number of fogs in August predicts the number of snows in the winter. This is so interesting! I love it! Where do you live? I’m familiar with Woolly Worm. We have Woolly Bears. A nearby city even has a festival every fall devoted to them. lots of acorns mean lots of snow, wooly bear caterpillars have stripes here in the northeast so there’s something about their stripes too. Such fun to look into predictions with my class.